I enjoy the act of walking with a pack in a remote wilderness – trekking, as I like to call it. 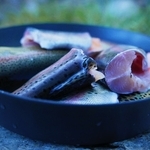 But I would be fooling both the reader and the writer if I did not admit to some anxiety about passing by a lake so teeming with beautiful and tasty trout and not being able to fish there, let alone enjoy them in a meal in scenic surroundings. Twin Island Lakes is one of those locations, and come hell or high water or exit a day late, I was going to have Twin Island Trout Tacos before the day was done. We left our camp at Ritter Lakes Basin at the “mid-morning hour” which is to say we started walking earlier than usual. The probability of fish tacos was looking pretty good. Instead of following Roper’s High Route through this section, we rolled the dice to see if we could bypass the Class 3 slab pile he recommends on the north side of the “80 foot waterfall”. We descended instead to the south of the creek, following easy grass, ledges, and talus from the lowest of the Ritter Lakes, and found ourselves at the bottom of the waterfall having barely touched our hands to a rock. We’ll call our route Class 1+ with a fear factor of nearly zero, in contrast to the white slabs to the north. After a great deal of fiddling with cameras, sun angles, and poses at the beautiful pond that receives the falls, we crossed the creek and made our way down to a hanging meadow. Peering over the lip of the meadow, we couldn’t see how steep the cliff was, but a stone falling off of it would take many Mississippi’s to reach the bottom (a map check later would reveal a precipice in the neighborhood of 400 feet in height). After leaving this dramatic location, we walked a tundra bench into the head of a hanging valley with cliffs above and below us. Our route followed a sinewy patch of grass that sneakily kept us out of danger and allowed us to make good northward progress. We dropped to a little brook to rehydrate in the blazing heat, walked out of the draw, and began our descent into the valley holding the headwaters of the North Fork of the San Joaquin River, and Trout Taco Heaven: the Twin Island Lakes. Class 2 benches of shattered slate, intermingled with a few cliff bands with nice foot and hand holds brought is into lush meadows, and the upper end of North Twin Island Lake. The creek was already full of the rainbow-golden hybrids that would be spawning soon. We found good pitches in meadowy bowls amongst glacial-polished rock slabs and domes. It didn’t take Chase long to get down to business, and by the time I had downed a liter of water he had landed a few dozen trout. With tenkara rods in hand, the three of us spent the remainder of the day catching rainbows and hybrids in the 8 to 14 inch range. Daniel and I kept several for dinner and the reality of a Trout Taco dinner made me happy. I ate a lot – at least a pound and a half of fish. In fact, it was the first time after any meal on this trip where I felt completely satiated, and it felt good to not cry after finishing the last bowl licks from a 5 ounce freeze dried dinner. And so with a full belly, and the satisfaction of having reached the end of a day filled with interesting trekking and very good fishing, we are simply left to enjoy this warm, dark, windless High Sierra night with nothing more than the bright Milky Way, and shooting stars, for entertainment. Tomorrow? Veering off the Roper Route now and staying high – back over the Sierra Crest, perhaps, somewhere north of here. – Finding secret passageways through cliff bands on the Sierra High Route northwest of Catherine Lake. – A fry bake full of fresh trout. 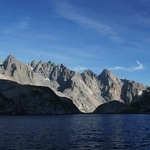 – The “back” side (sic) of the Minarets as seen from North Twin Island Lake. Be sure to check out http://instagram.com/backpackinglight as there are many more photos and mini-stories from this trip also being posted there.